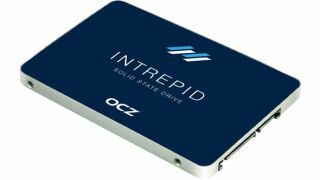 OCZ has added a new enterprise SSD to its Intrepid 3000 range of drives bringing even more capacity to deliver what it claims as its largest enterprise SATA SSD to date. The Toshiba-owned company unveiled the Intrepid 3700, which brings capacities of 240GB, 480GB and 960GB. But they all pale in comparison to the staggering 1920GB model, a big first for the Intrepid 3000 range of 2.5-inch drives since it launched with the Intrepid 3600 a year ago. OCZ's newest model runs on the firm's own Everest 2 firmware along with a Marvell silicon like its predecessor and that in itself differs from OCZ's past enterprise SSD offerings, which relied on SandForce controllers. The 6Gbps SATA Intrepid 3700 has the latest Toshiba A19nm 128GB eMLC NAND flash memory on board, sequential read/write speeds of up to 540Mbps/470Mbps, and random read/write speeds of up to 91,000 IOPS/13,000 IOPS. Over-provisioning has also been reduced from 28% to 12% compared to the Intrepid 3600 and this results in a higher capacity that can be used and a lower cost per gigabyte. Its power consumption is rated at 3.4 watts and the Intrepid 3700 can manage one drive write per day (0.5 for the 1920GB version). Plus the drives comes with power loss protection, AES-256 encryption and a five-year warranty. Pricing has yet to be revealed and OCZ only announced that it will be sold through its channel partners. The new drives will complement OCZ's range of Big Data-ready Vector and Vertex drives to make it an even more attractive enterprise offering.